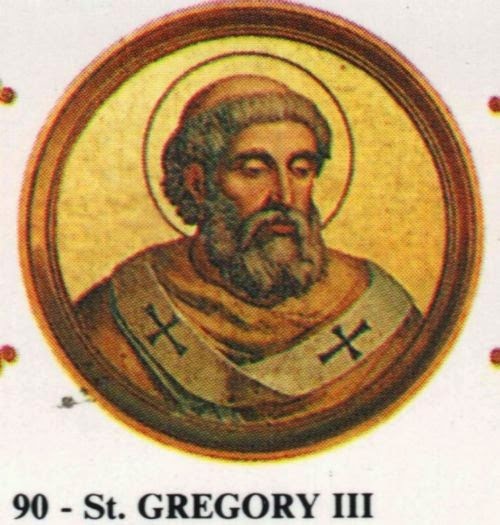 Pope St. Gregory III was the son of a Syrian named John. The date of his birth is not known. His reputation for learning and virtue was so great that the Romans elected him pope by acclamation, when he was accompanying the funeral procession of his predecessor, 11 February, 731. As he was not consecrated for more than a month after his election, it is presumed that he waited for the confirmation of his election by the exarch at Ravenna. In the matter of Iconoclasm, he followed the policy of his predecessor. He sent legates and letters to remonstrate with the persecuting emperor, Leo III, and held two synods in Rome (731) in which the image-breaking heresy was condemned. By way of a practical protest against the emperor's action he made it a point of paying special honour to images and relics, giving particular attention to the subject of St. Peter's. Fragments of inscriptions, to be seen in the crypts of the Vatican basilica, bear witness to this day of an oratory he built therein, and of the special prayers he ordered to be there recited. Leo, whose sole answer to the arguments and apologies for image worship which were addressed to him from both East and West, was force, seized the papal patrimonies in Calabria and Sicily, or wherever he had any power in Italy, and transferred to the patriarch of Constantinople the ecclesiastical jurisdiction which the popes had previously exercised both there, and throughout the ancient Prefecture of Illyricum. Gregory III confirmed the decision of his predecessors as to the respective rights of the Patriarchs of Aquileia and Grado, and sent the pallium to Antoninus of Grado. In granting it also to Egbert of York, he was only following out the arrangements of St. Gregory I who had laid it down that York was to have metropolitical rights in the North of England, as Canterbury had to have them in the South. Both Tatwine and Nothelm of Canterbury received the pallium in succession from Gregory III (731 and 736). At his request Gregory III extended to St. Boniface the same support and encouragement which had been afforded him by Gregory II. "Strengthened exceedingly by the help of the affection of the Apostolic See", the saint joyfully continued his glorious work for the conversion of Germany. About 737 Boniface came to Rome for the third time to give an account of his stewardship, and to enjoy the pope's "life-giving conversation", At Gregory's order the monk and great traveller, St. Willibald, went to assist his cousin St. Boniface in his labours. The close of Gregory's reign was troubled by the Lombards. Realizing the ambition which animated Liutprand, Gregory completed the restoration of the walls of Rome which had been begun by his predecessors, and bought back Gallese, a stronghold on the Flaminian Way, from Transamund, Duke of Spoleto, which helped to keep open the communications between Rome and Ravenna. In 739, Liutprand was again in arms. His troops ravaged the exarchate, and he himself marched south to bring to subjection his vassals, the Dukes of Spoleto and Benevento, and the Duchy of Rome. Transamund fled to Rome, and Gregory implored the aid of the great Frankish chief, Charles Martel. At length ambassadors from the viceroy (subregulus) of the Franks appeared in Rome (739). Their arrival, or the summer heats, brought a momentary peace. But in the following year, Liutprand again took the field. This time the Romans left their walls, and helped Transamund to recover Spoleto. When, however, he had recovered his duchy, he would not or could not comply with Gregory's request, and endeavour to recover for the pope "the four cities of the Roman duchy which had been lost for his sake." In the midst of all these wars and rumours of war, Gregory died, and was buried in the oratory of our Lady which he had himself built in St. Peter's. He died in 741, but whether in November or December is not certain. It is however, on 28 November that he is commemorated in the Roman martyrology.